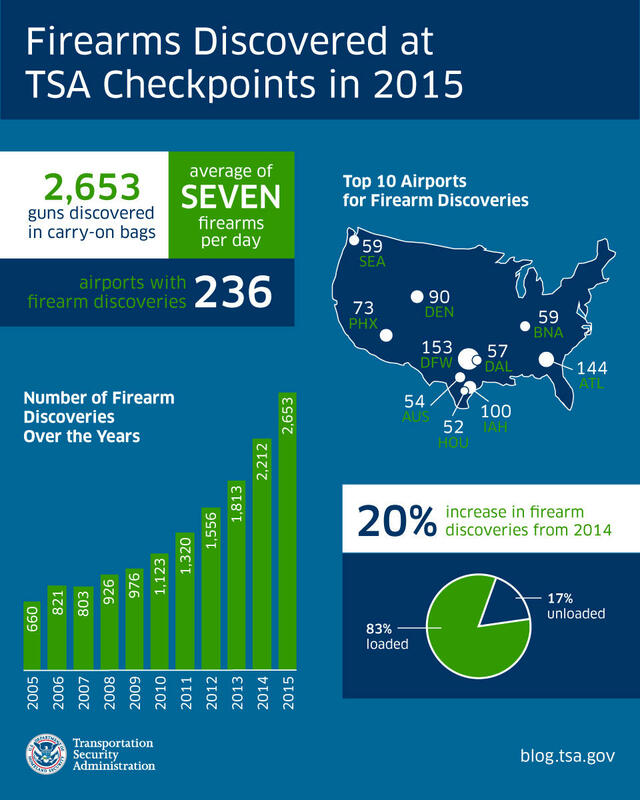 TSA screeners confiscated over 400 guns from travelers in Texas in 2015. Five of the 10 airports with the most seizures were in Texas. The Transportation Security Administration released statistics on the number of firearms seized at airports in 2015 today and half of the top 10 airports for weapon seizures were in Texas. Dallas-Fort Worth International Airport led the Texan pack with 153 seizures last year, followed by 100 weapon seizures at George Bush Intercontinental in Houston; 57 at Dallas Love Field; 54 at Austin-Bergstrom International and 52 at William P. Hobby in Houston. In total, TSA confiscated 416 of the 2,652 guns in Texas airports last year, 15 percent of all weapons in carry-on bags. 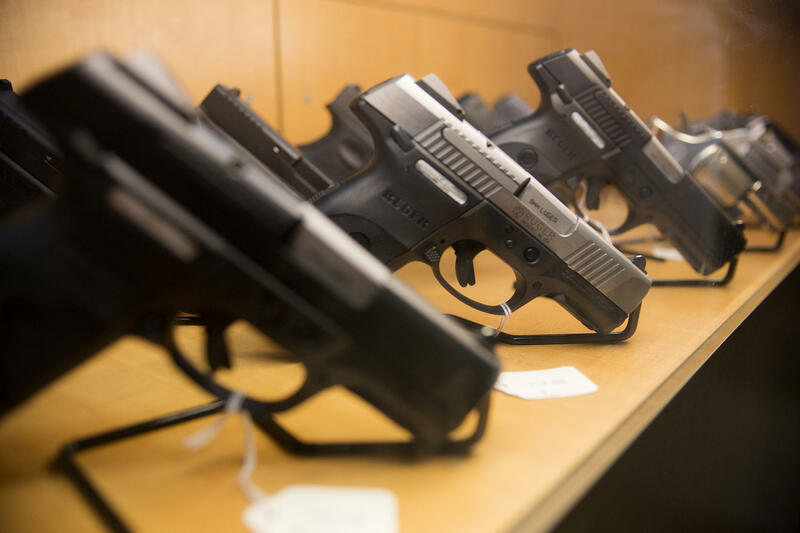 In a blog post on the TSA site, the agency says 83 percent of those guns were loaded and that security gate confiscations were up 20 percent. 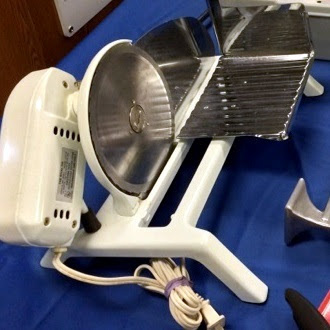 In addition, the agency found other understandably prohibited items like black powder, a live flashbang grenade, ammunition, fireworks, plenty of Batarangs, road flares, Ron Swanson-esque replica landmines, a sickle, (in one instance) live plastic explosives, some shuriken, or ninja stars, and even a deli slicer. 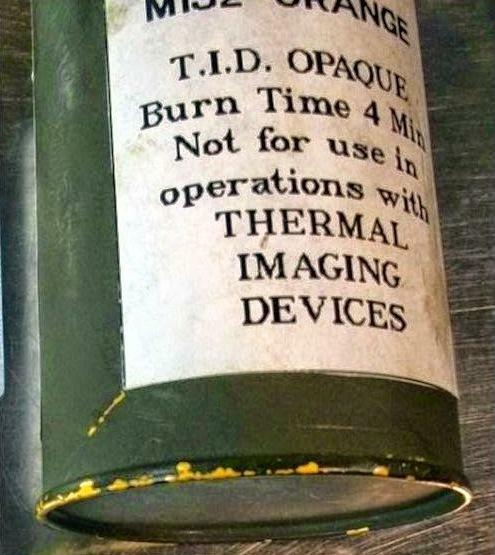 Active smoke grenade – TSA agents discovered a live smoke bomb in the last week of March. 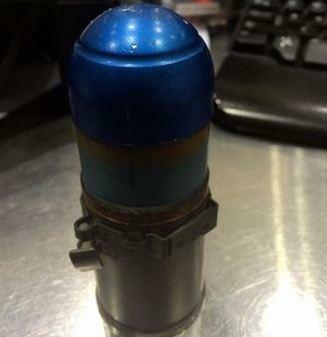 A mortar shell – Agents at ABIA found an inert mortar shell shortly before the holiday season. Apparently, traveling with inert mortar shells is a trend among Texas travelers – TSA scanners also found another inactive shell at San Antonio International Airport in August. A compound bow with a dagger attached to it – This one scores plenty of creativity points. 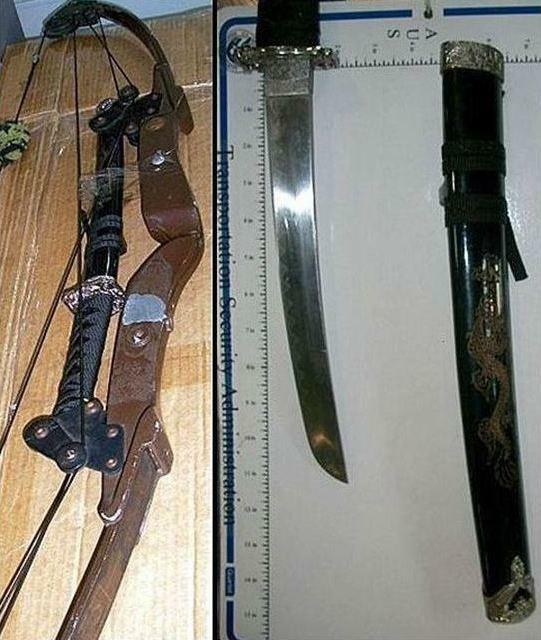 The seizure of this assumed "Walking Dead" fan's compound bow with an attachable ninja dagger (technically it's called a tanto) is weird enough to give hope to the hopeless that somebody is actually out there keeping Austin this weird and (likely) dangerous. With open carry in effect this year, it's possible those weapon seizures will go up at airports across Texas. So, if you plan on packing, the TSA has a section on its website with advice on how to travel safely with your firearms. 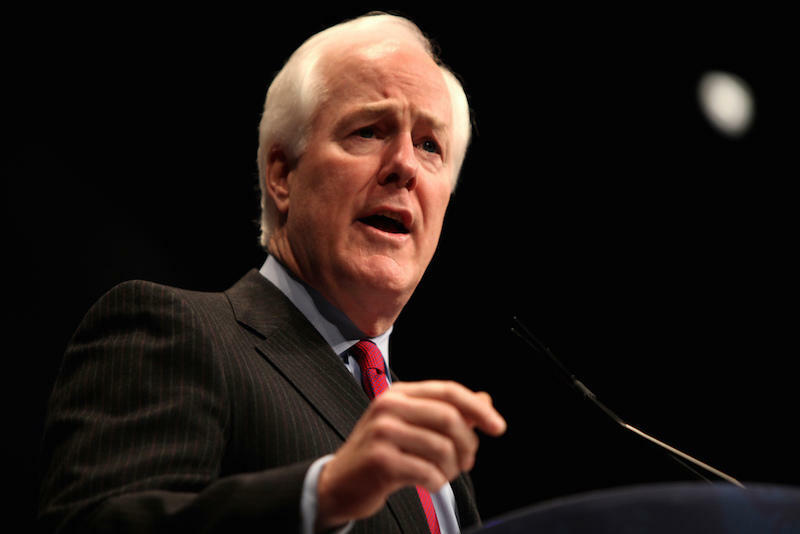 From Texas Standard: After the Sandy Hook shooting, President Obama and his colleagues in Congress pushed to close what they call a loophole in background checks. They were not successful. 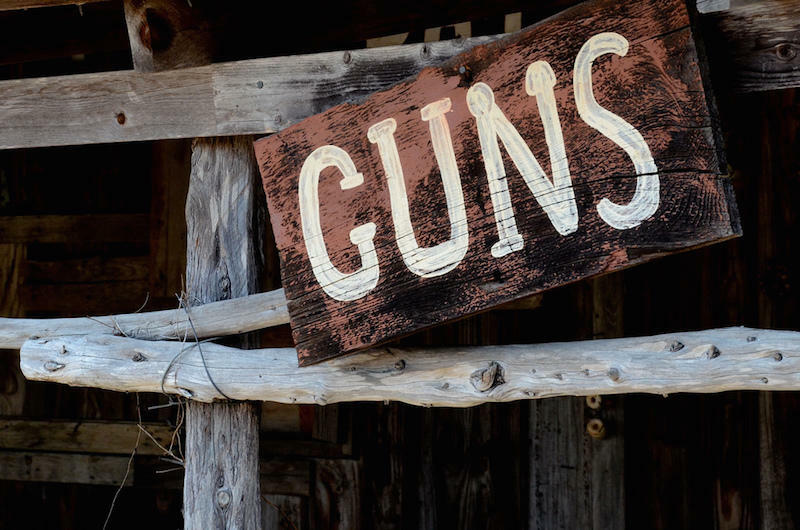 The word loophole, it should be noted, is a political term, primarily used by advocates of gun control who say there's a gap in the law when it comes to the sale or transfer of guns between private citizens.